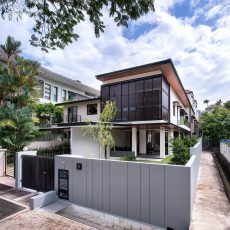 <strong>WRITE -UP</strong> The existing semi-detached house was a 30 year old house that had stood the test of time. Our clients approached us for a reconstruction of the existing house- with the intention to cater for their family consisting of the couple and their 2 young children. From the start, our brief was not to maximize the buildable area. The family appreciated the outdoors and the greenery in front of the house was to be preserved. It was a play area the children would most enjoy on an elevated land a few steps above the car porch. In rethinking the use of the spaces, we sought to make the indoor spaces functional whilst enhancing them with a connection to the outdoors. The ground floor public areas were "opened up" by demolishing the enclosing walls and enhancing natural light and ventilation with full height glass doors. A generously spacious timber patio outside of the living room was proposed to allow the living room to extend outside. A textured featured wall continues the dialogue from the inside to the outside and effectively blurs the boundaries. The result is a living room that is bright and airy. 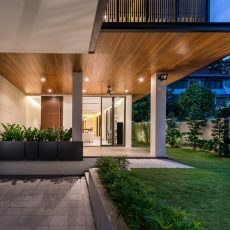 Stepping up to the dining area, the space for dining is similarly allowed to spill outwards with an extension of a outdoor timber deck - creating a romantic space for after hours relaxation after a family gathering. The roof was redesigned to include a series of skylights above the straight flight of stairs to the second storey. A generous family area greets one on the second storey. where a lush outdoor planter (which the Owners had a free-hand choosing the plant mix) spans the entire length. 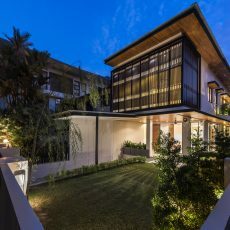 The planter is accessible by large sliding aluminum glass doors, and effectively brings in natural light and greenery to the upper storey. The planter also is visible from the common bath to the family area and stretches to peak into the master bathroom. The master bedroom is located in the front of the house. 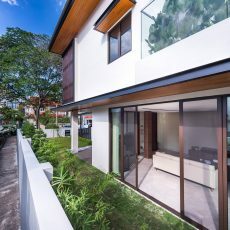 We designed the balcony space in front of the large bedroom with a more sensitive touch akin to a "sky patio" with a series of sliding timber screens. The Owners were able to adjust their placement in accordance to their preferences for lighting and privacy. Image should be cap at 1280px width or 1280px height. A horizontal image will be better for feature image. Image should be cap at 1280px width or 1280px height.